I think maybe I need to take pictures with a better camera. Voila, the 2013 version of our Tree of Thankfulness! Isn't it getting fancy? 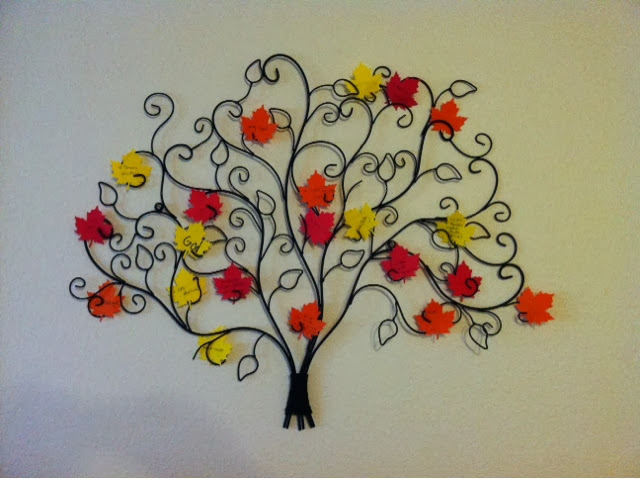 Dear People, long gone are the days of the taped construction paper brown tree with wonky leaves of all sizes. We almost didn't have a Tree of Thankfulness this year, because...to tell the truth...I was tired. And didn't think I could muster the leaves. But this curly-cue tree was one of the few items of decor that somehow wasn't trapped at the back of the storage unit, and it was already on the apartment wall. Because I like trees. Especially curly-cue ones. So the tree was already there. We just needed the leaves -- but as I say, I just wasn't sure that this year I could do all that tracing and cutting. Or at least the convincing of my minions to do it. And anyway, I thought, we we're not in our real house. Our apartment doesn't feel like home. One year without this tradition. Maybe it won't really matter. But I realized that it does. It does really matter. And when you are in transition -- and transition is one thing we seem to be getting a lot of practice at -- little traditions can really matter. A little tradition can remind you that even though circumstances around you are in a whirlwind, you -- and your family -- are this kind of people, who do this kind of thing. And so our Tree of Thankfulness is a reminder that our family is the kind of people who write little things they are grateful for on leaves through the month of November to remind ourselves of all we've been given. And in my opinion a tradition of thankfulness is an extremely important one! Studies have shown (now doesn't that sound official! -- don't ask me which ones) that people who are habitually thankful are generally happier. There is so much complaining all around everywhere. What if we were the people who could find something in every situation about which to be grateful? So the Tree of Thankfulness would have a 2013 incarnation. But there was still the problem of the leaves. With six leaves per day times thirty days plus extras for guests and extra thankful people, that adds up to a lot of tracing and cutting! But then...an inspiration. A leaf shaped punch! Why did it take me so long to figure that one out? It arrived like a flash and away we punched and thankful we were. These die-punched leaves aren't enormous, so we can't be super-duper thankful at a time, but we can always be thankful serially. And boy, doesn't it look together? I took the picture earlier in the month -- don't worry, it's filled in quite a bit since. And at the end of Thanksgiving weekend we'll take the leaves off and read them one by one before throwing them into the fire. And on the foundation of gratitude we can begin Advent. This is brilliant! I got the tree put up and a few leaves cut out, but then I didn't get more leaves cut out. A leaf punch is going on my list for next November.